The use of bitumen (which occurs naturally, but is most commonly a byproduct of coal) to pave roads did not become common until the 1870s. Sandstone paving like we see here required masons and was more expensive than cobbles. A few metres on your left is a stone-paved road ascending straight up the hill. 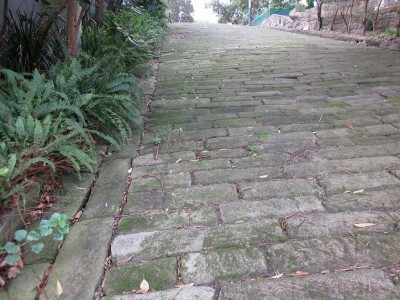 Although you can walk up the street, there is a set of steps immediately beside that make the climb less arduous. This stone-paved street is Cardigan Street which is flanked on the south by Cardigan Street Reserve. The western end of the reserve contains a rock platform of Hawkesbury Sandstone in situ. Lord Cardigan achieved notoriety by leading the British Light Cavalry (mainly lancers and hussars) directly into the mouths of the Russian guns at the battle of Balaclava in 1854 during the Crimean War, immortalised in Tennyson’s Charge of the Light Brigade. Half the men were killed or wounded, as well as half the horses. The French general remarked, “It is magnificent, but it is not war. It is madness.”. The date of construction of the stone road is uncertain, though it must be before 1855. This would mean it was built for access to Lyndhurst, but it is not easy to identify from the plan of 1847. It is likely such an expensive method of construction was used because of the grade of the slope. From the top of Cardigan Street it is possible to see the scale of destruction that would have followed had the Department of Main Roads plan to build expressways through Glebe succeeded. Most of the land south of Cardigan Street as far as Lyndhurst Street, including Lyndhurst itself, was part of the reservation acquired by the DMR from 1969, and the buildings on this reservation were simply allowed to decay. Not surprisingly, many of them were occupied by squatters, and when the Anti-expressway Campaign got under way, headed by Albert Mispel of the Glebe Society, some of their leaders became involved. After the defeat of the DMR’s plans, the reserved land was handed to the NSW Department of Housing, and the same team of architects who worked on the Glebe Estate, led by John Gregory, also designed the houses to replace those that had been demolished. The squatters were offered accommodation in the new houses. In addition to new and renovated housing the Department undertook landscaping works, including the present pocket park and the revamped retaining wall and pedestrian access to the new Darling Street houses. At the top of the stone-paved area, turn right into Darghan Street (no street sign). Walk a few metres to the south to Lyndhurst. Glebe Society web site: 'Albert Mispel and the Anti-expressway Campaign"